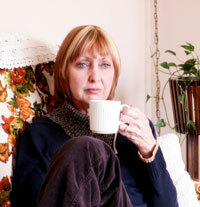 Women's Midlife Crisis: Do Menopause & Depression Go hand In Hand? The onset of a woman’s midlife crisis can present a challenge. Along with menopause and inevitible changes in family dynamics, it’s another lesson in change for women. Turning fifty, most have a remarkable resume that includes not only their professional background and experiences in the workplace, but the additional skills and knowledge gleaned from years of experience performing as nurturer, instructor, manual laborer, domestic CEO, community leader and child psychologist. This time in life is when the thought that “If I don’t do it now I never will” can begin to take seed for many women turning fifty. The idea of ‘women’s midlife crisis’ – a phenomenon long thought to be the exclusive realm of middle-aged men – is fairly recent. The feeling that time is fleeting and opportunity is in short supply can spur change …a determination for a women approaching midlife to explore continuing education in a different career area, to take action on a long-held dream of entrepreneurial activity, or make a commitment to helping others in a meaningful way. And if she happens to buy a surfboard or invest in a venture company along the way – so be it! Women approaching midlife are well aware that they are highly competent, financially influential, politically, socially, and professionally prominent. They possess considerable skills and resources – and the means and desire to explore them. Yet for some women, approaching their mid-forties or fifty and beyond resembles something like a commuted sentence. Maybe the freedom from their childrearing years has finally hit. They may or may not be financially independent, but may also have less of a tendency to worry about it. Life experiences may have contributed to their different outlook toward their own future: the death of a spouse, a parent, a child…a serious illness or surviving a disaster. All of these things happened to our mothers and grandmothers, of course, and can be fully categorized under the heading, “Life Happens”, but what is different now is our increased ability to deal with those crises, those feelings, and the inevitable changes they bring to our daily lives.